Relevance, resonance, and reach are the three attributes that make a person influential. Nonetheless, with social media at its peak, every digitally active user becomes an influencer. How do you recognize the influencer suited best for your campaign from such a wide haystack? To spot the right influencer, one needs to understand the pyramid of influence first. Top of the pyramid is occupied by high-end celebs and renowned brands for obvious reasons, followed by the semi-pro individuals who have a decent reach in the social media world. Below them are the citizens who have managed to grab enough attention for their talent and finally the bottom of the pyramid is concentrated with a large chunk of users – these are in other words the followers. These influencers could be across platforms such as Facebook, Twitter, YouTube, Instagram and more. There are also real-world influencers, who have a follower base through cultural aspects such as film, photography, music and food. They could also be called topical influencers. Once the influencer ecosystem is decoded and understood, brands and agencies can refer to the below five point plan for a sturdy influencer outreach campaign. One needs to define their market considering their location, network, and relevance of the topic. Take elements such as industry, keywords and target audience into consideration. Identify the influencers’ reach and resonance; take their Klout score, reach and Internal Referrals into consideration. Choose influencers that align with your brand as opposed to influencers that are popular. Create a plan and then engage with them. Develop personalized communications based on every influencer and try to stay relevant to their audience. Have specific and clear goals; create a mutually beneficial relationship. Try to create a complete experience with your brief and hence the campaign. Keep the goal and the campaign realistic. Be patient and don’t expect the end results to miraculously shoot up in a day. Measurement metrics has to be devised basis the goal of your campaign. Brands can collaborate with influencers over various touch points including – speaking engagements, event participation, written contributions, and brand partnerships (in the form of sponsored posts or giveaways). Influencers are an integral part of the community. 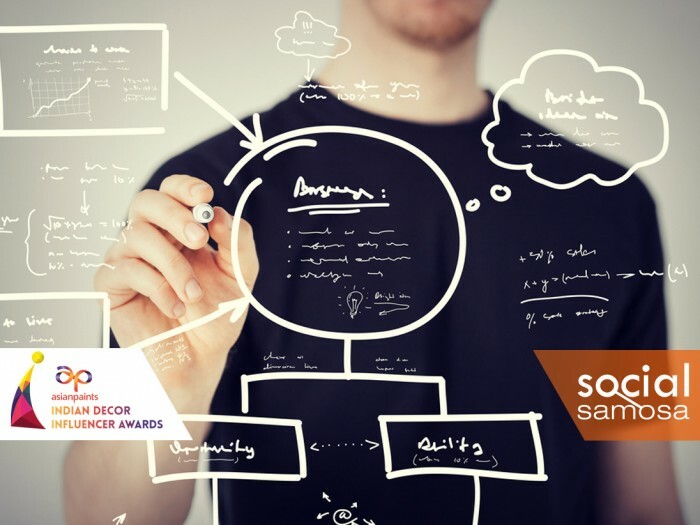 To recognize their work in the décor space, Asian Paints and Social Samosa are proud to present Indian Décor Influencer Awards. Join in the initiative – nominate yourself or a fellow influencer. The story is based on a presentation by Simply Measured.